“Hard water” is water that contains a lot of minerals such as magnesium, and calcium. Most municipal and city water systems that draw their water supply from groundwater get these substances from surrounding rock and soil. Hard water does not only have an after taste, it is also bad for the hair and skin. It is very damaging to plumbing fixtures, drainage pipes and other household appliances and devices as well. 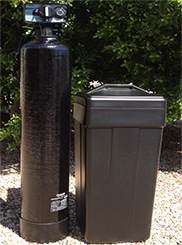 The best way to “soften” water is with the use of a water softener. Reverse Osmosis Systems (RO) : Water pressure is used to force water molecules through a very fine membrane leaving the contaminants behind. Purified water is collected from the "clean" or “permeate” side of the membrane, and water containing the concentrated contaminants is flushed down the drain from the "contaminated" or “concentrate” side. The average RO system is a unit consisting of a sediment/chlorine pre filter, the reverse-osmosis membrane, a storage tank, and an activated-carbon post filter. Using reverse osmosis, the industry’s most sophisticated filtration technology, our drinking water system delivers the best water possible. Reverse Osmosis water can be used for; drinking water, ice cubes, baby formula, cooking water, soups and sauces, juice, coffee, tea, weight loss and low sodium diets. The household uses; humidifiers, steam irons, plants and even for aquariums and pets. So forget the daily costs of bottled water! Your coffee, tea and juice will be more flavorful. The food you prepare- like soups, sauces, fresh fruits and vegetables- will taste better. You will see the difference when you look at your crystal clear ice cubes. Our drinking water system gives you a constant supply of water at its best. Call Arnold’s Service Company for all your Sales, Service and Repair needs.